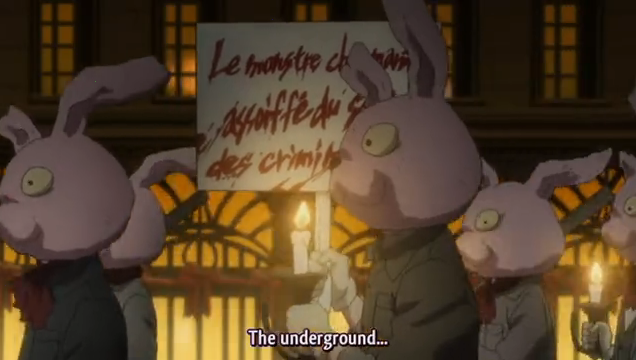 The underground are masters of disguise, able to blend seamlessly into any background. Political intrigue, the joys and anguish of illicit love .. this final episode of Gosick had it all. There are some who say the series will continue without the presence of its diminutive heroine, but I say, “pish”! In fact, I say, “pish posh” to that. It may be difficult to believe the following summary of events, especially if you have already watched the episode. 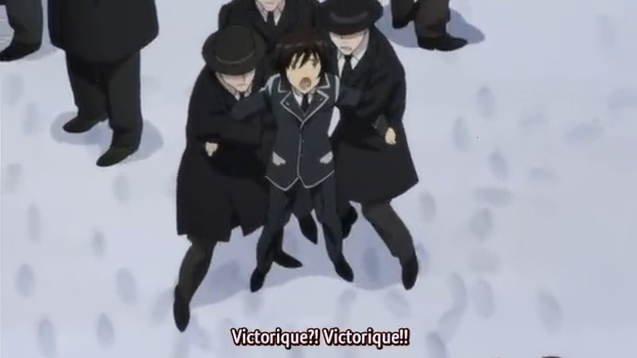 Be prepared; the following shocking events are bound to shock you, particularly when Victorique de Blois dies! Kujo is framed for the murder of a classmate. Apprehended by Greville's thugs for a crime he did not commit. Not so fast! Yeah, back in the old days, this episode would have opened this way. Thus our mystery would have kicked off. Instead this final episode goes in a shockingly unexpected direction. The power of redheads is too great. Kujo ends up cheating on Victorique with Greville's old girlfriend! When Victorique learns of Kujo's infidelity, she kills herself. 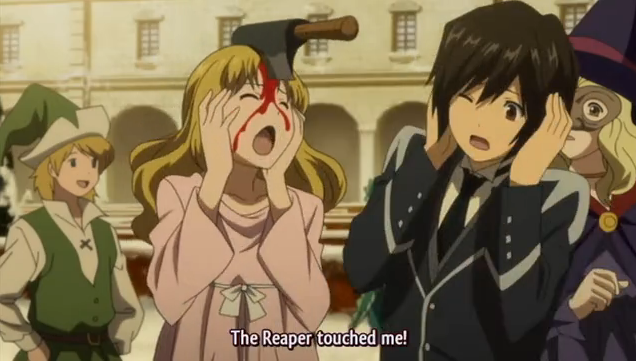 Seeing Victorique's corpse is too shocking. 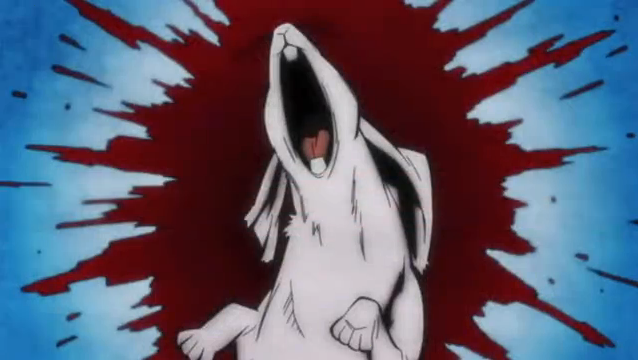 Please look at this relatively mild image of a rabbit instead. Now that Victorique is dead, I expect the series to end immediately. 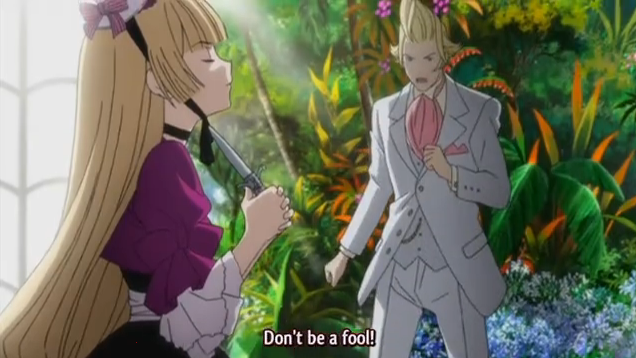 There are some that say Gosick can continue without her. Hanners has long argued that the show would be better if it was dedicated to recounting Greville’s adventures as a police detective. I disagree. I expect that next week’s planned onsen episode will be poorly received, resulting in a premature cancellation of the series. Update: Now that Victorique is dead, Hashihime has linked to a dirge-like character song (sung by Aoi Yuuki). It is actually quite nice (if rather sad). Not the sort of song one usually hears, sort of orchestral Gothic. Dude! The Horror! The Horror! On a slightly different note, the last scene of this episode was one of the most compelling of its type that I’ve seen. For this particular character to lose that struggle to control herself was particularly moving. Greville: a hard one to read, but I can’t help but feel that he’s not a happy camper. His father has a strong hold on him, but he seems to be growing steadily more upset at the things he’s required to do. Back in Episode 10 we see him taunting Victorique that a Gray Wolf can’t love anyone…you have to wonder what he thinks of those words now. Both excellent points. With respect to Greville, they have managed to dance along that line without revealing what is really in his heart. Is he a good guy, but constrained by his father’s demands? Is he willing to go along with everything because he is a bad guy himself (perhaps jealous of the attention his father pays his sister)? One can imagine this going either way. Yes, they’ve kept him intriguingly ambiguous. About the only thing I can recall that might hint it’s the former as opposed to the latter is the recent episode where they were performing the ceremony on her in the theatre and he seems to become upset at her treatment. If that’s the case, we’ll have to see whether he screws up enough courage to challenge his father when it counts. Yes. Everyone should watch the episode, and make up their minds for themselves. Heh! Humor…not for the timid. THE PREVIEW LIED… THEY GOT SEPARATED! I have a gut feeling that this is not the first time a preview mislead us this badly… Sora no Woto was kind of notorious for that with the episode 7 preview. 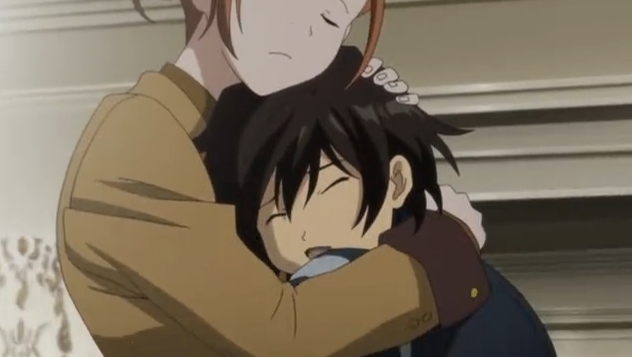 It was a pretty sad way to end the episode, no? I think the reason they changed the ED to a sad song was to reflect the tragic ending of this series. Technically she’s a fictional character, so she’ll never die as long as we carry her in our hearts. NON-technically, Joojoobees didn’t actually answer your question. You might want to factor that into your cogitations. One also might want to factor in the general trustworthiness of anything read on the Internet. My 7-yo nephew showed me a video he found on youtube of a “real” alien. Bonus points for using the term “cogitations”, though! another question will there be season 2 of gosick? I don’t think so. I think this one is all over. I know this show is from a series of novels that is on-going, but I think if they had serious intentions of another season they would have ended it a bit differently. The very last sequences were SO lyrical that it really seemed like they were saying “goodbye” to the characters. But — if the DVDs sell enough — who knows????? I completely agree. They “ended” the series. Attempting to extend beyond this will deface what they have already done.